Today, national khoomeizhi Khaigal-ool Khovalyg, solist of the Huun-Huur-Tu ensemble torns 50. He has been described as the “engine driver” when the American musicologist Ted Levin, comparing “Huun-Huur-Tu” to a train, evaluated the different functions of the musicians in the group. He is a native of one of the most “musical” places of Tuva – Dzun-Khemchik sovkhoz “Iskra” ( many other khoomeizhis are from this place, including Oleg Kuular of “Shu-de”). Kaigal-ool started his professional career in 1979 as a member of vocal-instrumental ensemble “Ayan”; in those years, the artistic programs for this ensemble were prepared in Leningrad. In 1989, together with other khoomeizhis – Kongar-ool Ondar, Ivan saryglar, Boris Kherli, Vyacheslav Danmaa, Sergei Ondar and others – he joined the ensemble “Tyva”, the first professional collective of khoomeizhis, which was jointly founded by the musician Gennadi Tumat and musicologist Zoya Kyrgys. The collective’s repertoire consisted of rare recordings collected by thye schiolars of Tuvan scientific research institute of language, literature and history during field expeditions and meetings with old khoomeizhis. Somewhat later, the founder of the group “Huun-Huur-Tu”, Alexander Bapa also followed this route. 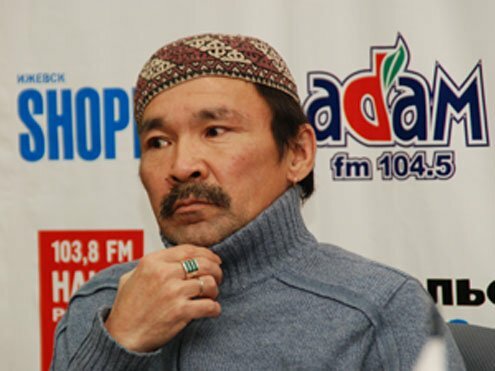 Kaigal-ool Khovalyg was invited to join the new group. Today, the group is famous all over the world, and Kaigal-ool Khovalyg is the acclaimed master of khoomei both in his own native country as well as outside of it. In February 2007, Andrei Chymba interviewed the members of the group. We present excerpts from Kaigal-ool Khovalyg’s answers. In the song genre I prefer the composers Alexander Laptan, Mergen-Kherel Mongush. Among the youn ones I like the work of Anderi Mongush, because he is so close to the traditions. True, there are some melismata, elements which are not really inherent ot Tuvan music, various different influences, but that is correctable. Well, if a Tuvan is not homesick, there must be something wrong! Ever since I became an artist, since I started playing with “Ayan” in the late 70’s, and to this day, as soon as I get a little bit of free time, I head for home right away. So that is no better or worse. I see both problems and good things: there is enough cattle, people who are striving for a bright future, who look ahead. The nation has spirit. On the other hand we are too inert, we are used to waiting. In other countries you see that everybody is hurrying somewhere, is busy with something, for himself or for his family. People fight for their daily bread. And here? Always waiting for something, contemplating. Everybody is trying to run away from the villages to the city. And who will stay in the villages? Of course, I understand that progress is necessary, but at the same time the civilization has destroyed a lot. Here, in the first place, they think of economics and material development. But, in my opinion, we need people who would stir the people to action, to get the Spirit of the people to move with some real idea. No matter what , Tuvans are a talented people and learn everything very fast. But leaders are necessary, read leaders who would not upset the traditions, because it is definitely necessary to hold on to the roots. Some say: why do we need civilization? Stick to your roots, be what you are. But thyen there are others, who come here and are surprised how filthy it is here. Garbage everywhere. I am especially ashamed of the condition of the banks of Yenisei. Horrible sight: The Great River in the embrace of garbage. When you watch this in the presence of foreign visitors, you feel burning shame. - One has to be brought up to it from childhood. It rooted in our traditions. Dink at every mountain pass. We both get drunk, we and the Spirits of the place. - We like our “ego”, praise it, spoil it, protect it and can’t hear anybody else, who also has his “ego”. There is no respect, no upbringing. What is noteworthy, in America for example we give concerts in kindergartens or schools in the mornings. It is amazing how the little kids are so curious, eager to learn, they ask questions about the group, about Tuva, about our instruments, etc. it is interesting to answer them and it is interesting to be around them. It is impossible to imagine such a sight in Russia or in Tuva. - And how to hide from envy? - The worst of our national traits, which I personally can’t stand, is envy. At first we praise, elevate to heavens, but then we start to abuse and hate. We do not have to go too far for examples, take the wrestler Ayas Mongush. At first, how they praised him, elevated him, and what is going on now? That is not suitable. He is our national hero. He should be respected. Res-pec-ted! And they did the same thing with us, “Huun-Huur-tu”. And why, I say, they go to foreign countries and make money on our culture? They are selling the secrets of throat singing! They are making big money – dollars?! Things are always hard for those who go first, same for Ayas, and for us too, generally. Very hard. We literally chop out a path through huge taiga for thiose who come after us. Only by hard work you can show that you are right. First you have to start with chopping out a path, then a bigger path shows up, which will make it easier for the young ones who follow us. And then, there, a road shows up, wide and spacious. - But where do you get the strength? 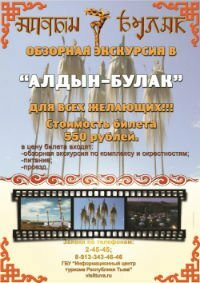 - In September 2010, a festival of throat-singing will be dedicated to the jubileum of the National khoomeizhi, organized by the Center of Traditional Tuvan Culture.